Note that rhubarb contains oxalic acid, which, if consumed in excess, is toxic (oxalic acid is also present in carambola, spinach, chard, sorrel, beans, cocoa, and most of the berries). 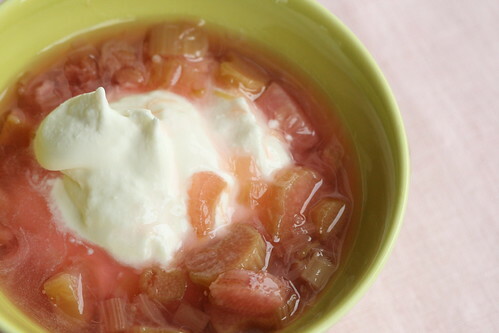 As oxalic acid inhibits the absorption of Calcium by the human body, it's recommended to serve rhubarb with dairy. This fruit soup goes well with a dollop of whipped cream or some curd cheese dessert (see photo below), or even thick Greek yoghurt. Rinse the rhubarb stalks and slice thinly (5 mm or 1/5 of an inch). If you're using tender rhubarb stalks, then there's absolutely no need to peel them first. Place wter and rhubarb into a saucepan and bring to the boil. 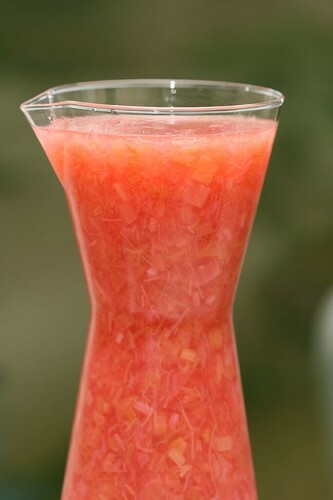 Simmer for 5-7 minutes, until rhubarb softens. Add sugar, stir until dissolved. Mix potato starch with some cold water until you've got a runny paste. Pour this into the fruit soup, stirring constantly. Bring back to the boil and remove IMMEDIATELY from the heat (if cooked for too long, the fruit soup becomes thin again). Note on the use of starch. It's more common to use potato starch in Estonia, but you can certainly use cornflour (UK)/cornstarch (US) instead. If doing so, cook the kissel for a few minutes after adding the starch, as cornflour/cornstarch needs to be heated properly in order to kick-start the thickening action. I have tried with corn starch and it just doesn't work for me. Both times it haven't turned thick. Is there some special trick to it? So, I prefer potato starch. I'm glad that lately even regular grocery stores have started to carry potato starch here in US. Years ago you could find it only from the Chinese or Russian stores. Lennuk - mina olen teinud kisselle maisitärklisega ka ja kenasti. Maisitärklist tuleb kindlasti paar minutit kuumutada, alles siis pakseneb.